Are you enjoying our weekly quotes on Facebook and Twitter? 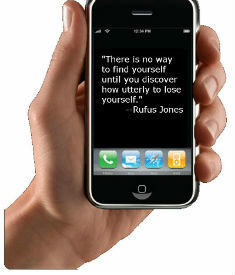 How would you like to begin your Monday morning with these quotes sent as a text message to your phone? Pendle Hill would like to be that first chime of the day on your phone and start your week with a wonderful message. Receive inspirational quotes from past and present Quakers, as well as other insightful people over the course of history. You will only receive these messages if you submit your name and phone number. Click here to complete the short form; you may remove your name and phone number at any time by sending e-mail to lblount@pendlehill.org.